Just so you don't have to leave our ebullient and soul-uplifting Issue 69 Podcast at home, we've now made it available in a miniature, easy-to-carry tote version. 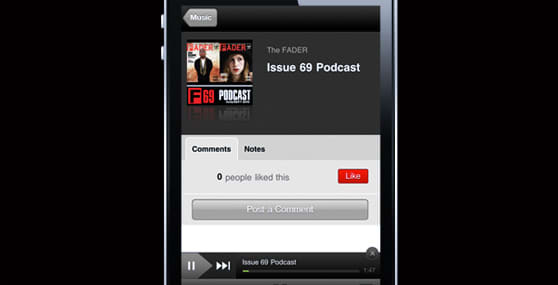 Stream it forever, wherever you go, in our handily sleek new mobile app for iPhone and Android, and you will never again feel alone—Spoek Mathambo, Glasser and a clutch of other kind, lovely musicians from FADER 69 will be right there to comfort you. As ever, both the mobile app and the podcast are totally free, like birds, the wind and MIA. Download the app right here, right now.